LaBellaVida: LUSH Hottie Massage Bar! So i've been pretty ill recently dying of a sickness bug and as i've been getting better i have been craving a pampering session! Meaning that my boyfriend will be blackmailed kindly talked into giving me a back massage! I want to use my massage bar that i got a while ago from LUSH and so what better a time than now to soothe my stiff muscles after being ill! "Hottie is designed to get to grips with areas of the body that have been overworked and are in shock. The blend of warming oils bring warmth and comfort to the area - using ginger oil and black pepper oil to stimulate the blood flow." First impressions of this bar, were that i hated the smell. However, it actually grew on me a bit! I'm not sure what i hated about it to begin with, i think that it has a slightly peppery smell, not sure, it just takes a while to get used to! The bar melts a little on contact with warm skin which makes the bar sort of slippery but it leaves an buttery residue on the skin. It feels lovely while being massaged and it is really relaxing due to the raised bumps on the bar. It has a slight warming sensation but not overly so and it feels really soothing and relaxing. Overall, this massage bar is really great! It's only down points i would say really were the initial smell, although i don't actually mind it now, and also, i would say that the butteriness it leaves on your body seems to stay wet for quite a while, i felt as thought i just wanted to go in the shower to wash it off. It is relaxing and lovely if used just before you are going to bed or not having to put on a top and go anywhere straight after! I want to try other massage products so if you have any recommendations let me know! You can purchase your own Hottie HERE for £5.75 a bar! 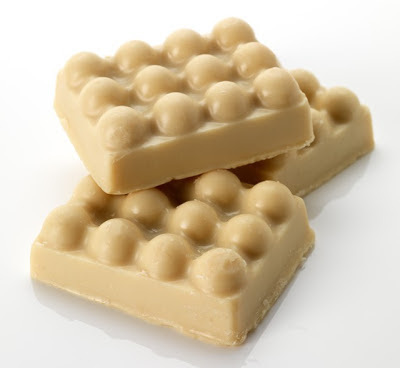 Have you tried any LUSH massage bars? It's pretty good. I like how it kind of melts on the skin! I've hardly tried any either! Keen to try some more now though! looks like white chocolate! this seems lovely, i'm keen to try it! It does a bit doesn't it!